Today I was the guest author at Village Elementary School, the school where my mother-in-law teaches. It was great! I visited with three fifth grade classes and talked to them about the process of creating a novel from idea to finished book. I also read them a chapter from INTO THE WILD and showed them the final manuscript, the ARC, and the finished hardcover book. (1) The kids were awesome. Smart. Nice. I wish I'd had the chance to actually get to know them individually. (2) I gave each student a bookmark, and at the end of my visit, they all wanted me to sign the bookmarks. This made me feel like a rock star. (3) Five years ago, a student in this school read an early version of INTO THE WILD (back when it was called THE WISHING WELL MOTEL). I can count on one hand the number of people in the world who read early versions of ITW. Today she came over from the high school to meet me and listen to me talk to the class. How cool is that? (4) I was in fifth grade when I decided to become a writer. So visiting the fifth grade today felt very appropriate. 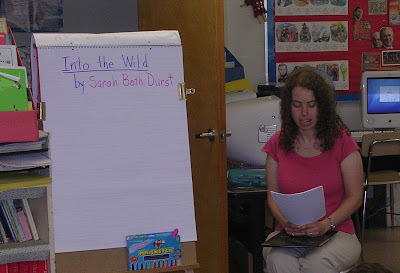 (5) One of the students had a copy of INTO THE WILD!!! It doesn't officially come out until next week, but this girl's mother found it in a bookstore, and she brought it in for me to sign. I did the Snoopy Dance of Joy right there when I saw it. Somewhere, somehow, INTO THE WILD is out there! Nine days early! After school, my husband and I drove to two bookstores in the area to try to see it on the shelves for ourselves, but no luck. If anyone sees it out there, please send me photos! I want pictures of first sightings! I sure will! The Barnes and Nobles near my house always puts up books early (except for the Harry Potter books, of course)-so I'll be on the lookout! Thanks, Sookie! I stopped by another bookstore today. Just couldn't help myself. It was an absolute joy to have you meet my students,Sarah. You are an inspiration! Not only are you a super author, but you're a wonderful teacher. My class was spellbound as you read and discussed the writing process. Perhaps some day one of these children will be able to say that he/she was inspired to be a writer in 5th grade and it will be all because of YOU! I went to Village three years ago! Why doesn't the middle school (across the street) get guest authors?! Lynne: Thanks so much! That's so wonderful to hear. It was really a pleasure to visit your school. The kids were all fabulous. I had such a great day.